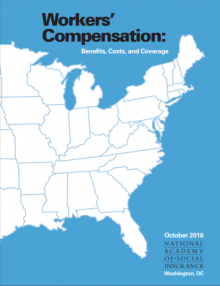 Workers' Compensation: Benefits, Costs, and Coverage is the twenty-first in a series by the National Academy of Social Insurance to provide the only comprehensive national data on this largely state-run program. The study provides estimates of workers' compensation payments—cash and medical—for all 50 states, the District of Columbia, and federal programs providing workers' compensation. Read the national press release. Read state-specific findings for Michigan, New York, Ohio, Oklahoma, Tennessee. Review the sources and methods used to produce the state-level estimates in the report.